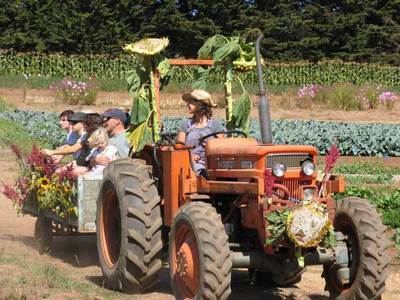 Harvest Festival at UCSC Farm: October 4! 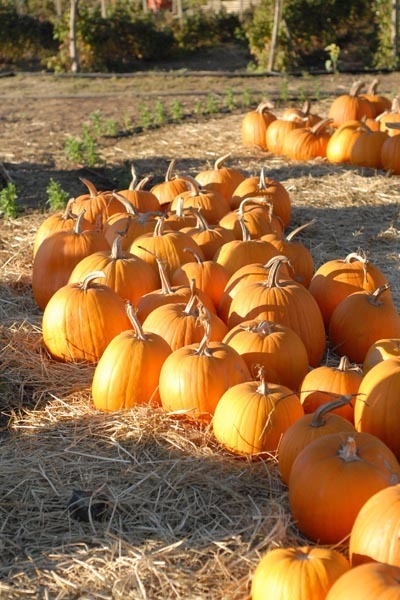 Grab your kids: this weekend is the biggest event at the UCSC Farm all year 'round! I took this photo a couple of years ago, when we took Logan for the face painting, pumpkin painting, apple bobbing, and other great activities for kids. And the whole family. 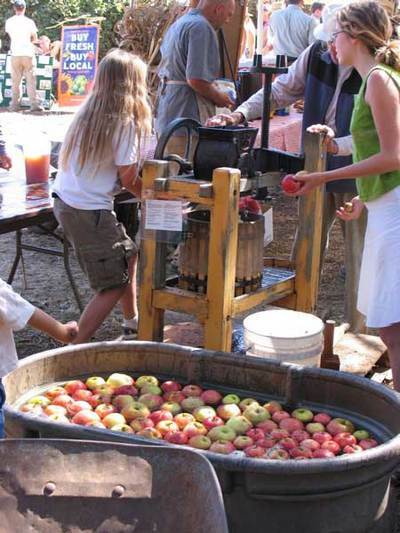 The festival has expanded this year to include workshops and cooking demonstrations among the already packed schedule of live music, apple tasting, an apple pie bake-off competition, and so much more! 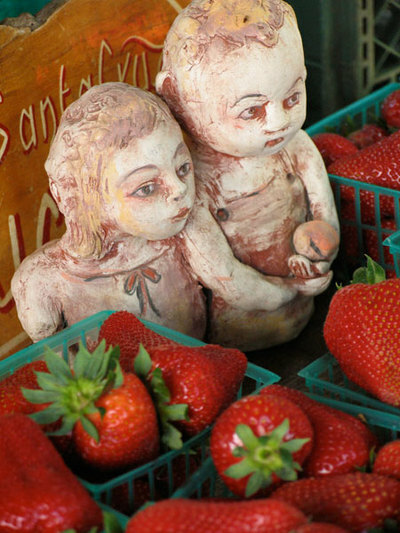 There are walking tours of the farm, tractor rides, and so on. And LOTS of good food to eat. $5 and under for admission to one fantastic farm event. Highly recommended! To see the complete schedule, including the live music, visit the CASFS website here. That's all until tomorrow. I've been under deadlines with four clients, and hope to catch a break in the action soon. THOUGHT FOR THE DAY, from Michael Moore: "The Rich Are Staging a Coup This Morning." Thanks for visiting, and now get on the phone with your Congresspersons. Hazon Is Hebrew for "Vision"
A fellow member of the Board of Directors for the Friends of the UCSC Farm & Garden gave me this postcard at our monthly meeting this week, and I promised her I would put it on my weblog. 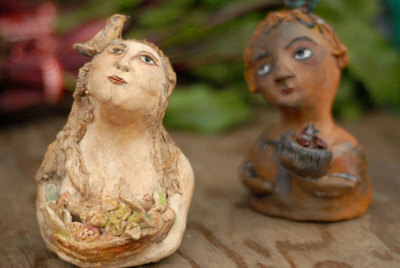 Come be a part of the New Jewish Food Movement! 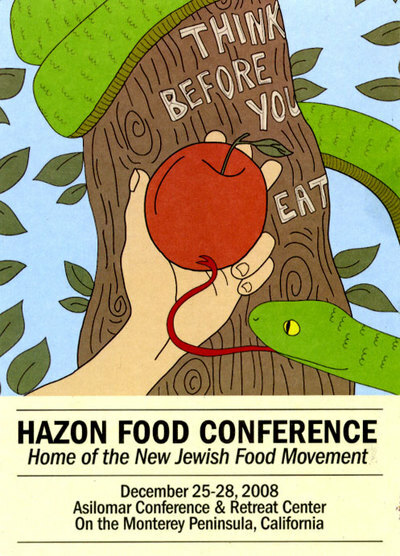 If you have questions about the Food Conference or want to find out more information about Hazon, feel free to contact Emily Jane Freed at emilyfreed2000@yahoo.com. Set atop the rolling hills near a slough in Watsonville, beautiful High Ground Organics farm is a vision within a vision. I'm having trouble finding words to describe it, so here are some photos from a visit a couple of years ago. 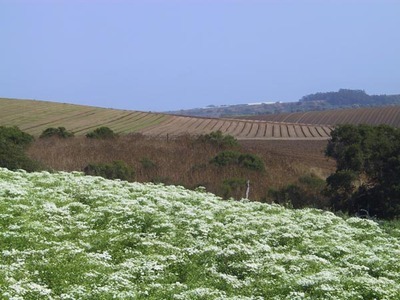 High Ground Organics partners with Mariquita Farm in a robust CSA, and one of the charming things High Ground brings to the table (so to speak) are all the varieties of flowers they grow, which make the farm itself exceptionally beautiful. On August 17, you can have the chance to dine on the farm: Open Space Alliance is hosting a farm dinner with Chef Jozseph Schultz (formerly of India Joze). About Jozseph's food: he catered the sit-down dinner at my best friend's wedding a couple of weeks ago for 150 people. The food, with all its Pan-Asian influences, was fantastic. See his menu below, and read the press release from Open Space Alliance: one of my favorite groups and causes in the county. 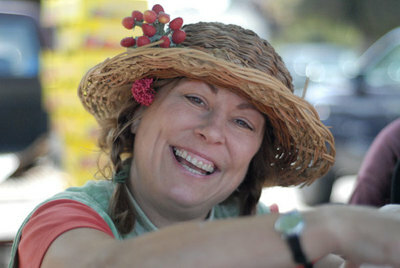 Patricia Rain, summer 2005, at a farmers market. I heard from Patricia two days before my birthday, and promised I would publish the letter she sent out to friends and family, in its entirety. Although it drives me a little crazy to send a group letter rather than to write individual notes or phone each of you, time and energy in our crazy, hectic world seems to often be in short supply. Also, some of you have heard various parts of this note already and I apologize for boring you twice. But frankly, I didn't get holiday notes out this year between holiday business demands and the loss of four friends between Thanksgiving and the second week of February, so I'm writing a "one size fits all" note. So, Happy New Year, Valentine's Day, Presidents' Day Easter, Passover, Mother's Day, Memorial Day and Father's Day. :-) Hopefully I can pick upo again by the Fourth of July. Getting through the holidays was difficult as I spent many days in hospitals and at memorial services. There were some wonderful special moments with Theo and Zane, especially Christmas morning when they walked into the living room and couldn't believe that Santa had not only come but that he knew they would like a big boy bicycle and tricked-out tricycle even before they knew they wanted them. The looks of amazement and joy were a huge antidote to the difficult hours of helping friends through their transition from life to death. By January I was pretty burned out. Blessedly, I had a magnificent trip to look forward to, one that I had initially booked through the Santa Cruz Chamber of Commerce. However, due to my contacts throughout the world, the next thing I knew was that I was having a two-in-one journey to China! The first part was the tour, and the second was eight days with a research scientist on Hainan Island in the South China Sea. As often happens when I travel, nothing was firm about the second part of the trip until days before I left, but it all came together into one remarkable adventure. BEFORE I BEGIN: I'm wrapping up a project that requires a lot of energy, and things in the family are a little gnarled, and [insert a reason here]. The calendars were held up in customs, but I am told they should be here on Monday, which is tomorrow for me, and today for most of you. Calendars are obviously a source of anthrax, so I can understand the caution of the Port Authority in not hastening them through. Argh. 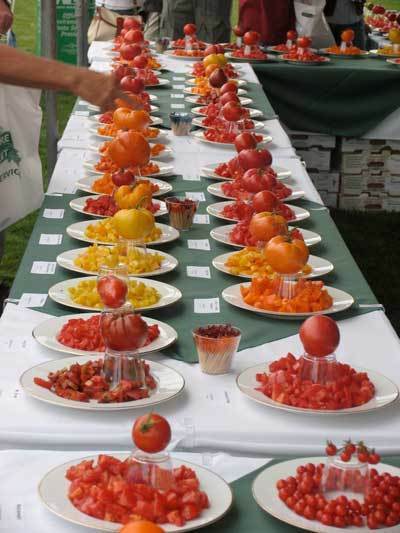 PICTURED HERE: This is just one tiny section of one giant table that spanned a giant tent, where visitors to Gary Ibsen's Nature Sweet - Sunset - Carmel Tomato Fest were tasting 350 different kinds of heirloom tomatoes, under a benignly overcast sky last Sunday. I was fortunate (blessed, actually) to have attended with a press pass, and to have invited my farmer friend, Linda Butler, of Lindencroft Farm, as my guest. 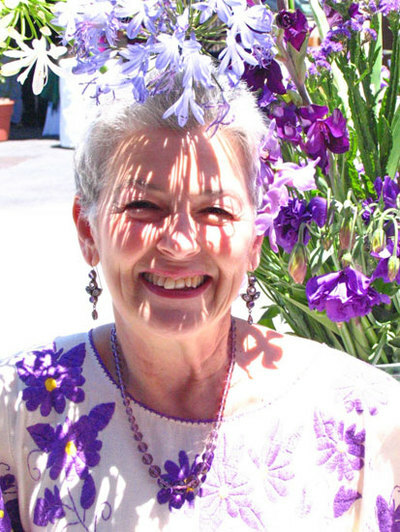 We traveled with Cynthia Sandberg of Love Apple Farm: this event is pretty much Christmas for her every year. And it's where she and I met and hit it off for the first time, three years ago.